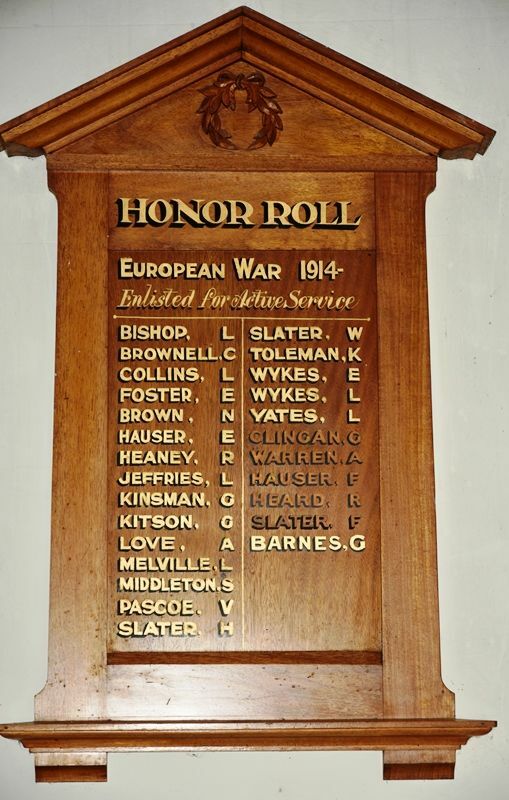 A wooden honour roll commemorates those connected with the church who enlisted in World War One. The unveiling of an honor roll at the Methodist Church on Sunday evening attracted a very large attendance. The honor roll contains the following names:—L. Bishop, C. Brownell (killed), L. Collins, F. Fisher, N Brown, K Hauser, Ray Heaney, L. Jeffries, G. Kinsman, G. Kitson, A. Love, L. Melville, S Middleton (killed), V. Pascoe, H. Slater, W. Slater, K. Toleman, E. Wykes, Len. Wykes, L. Yates. Camperdown Chronicle (Vic), 26 February 1916.